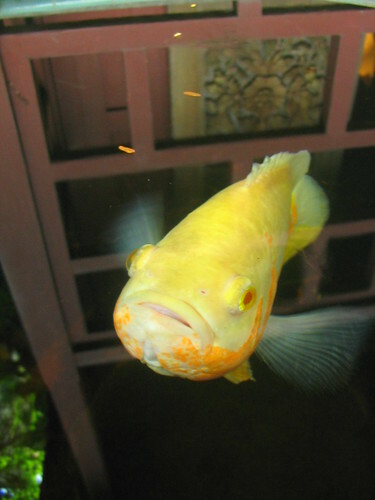 In front of one of the houses inside Jim Thompson’s compound is a huge clay pot that is filled with water and inhabited by this fish. With tours around the house every 20 minutes, I think he has learned to pose when people get near and not dive and hide. He was facing the house when I came, toting my camera, and when he noticed me, he swam around and posed. What a beautiful color combination! Is that a koi? He sort of looks like one, but I’ve never seen one w/ colors like his! …I have the urge to stick my finger in his mouth to see what he’ll do! That is one very nice shot! It seems like the fish is floating in mid-air. Good work! I think we call that fish, Oscar or something. Lovely creature.